Most adults forget how difficult it is to be a student. Sure, you might not hold the same responsibilities as a regular adult, but you still hold the responsibilities of being a student and a child. You spend long days attending classes, taking tests, taking part in after-school activities for extra credit and come home only to do household chores, homework, and a lot of studying. The scale of responsibilities for each student may vary but it’s all quite similar. Every student goes through the same pressure and stress to keep their grades up. With how hectic things can get, it’s important for a student to have a schedule example set out for them. 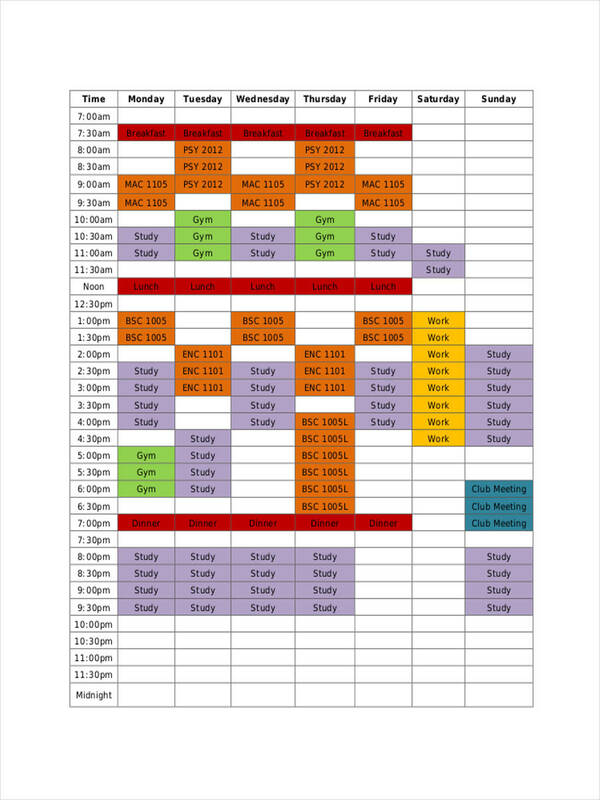 What Is a Student Schedule? A student schedule, from the name itself, is a type of schedule designed according to the responsibilities of a particular student. It typically coincides with one’s school schedule. This could be anything from classes, study periods, lunch breaks, club meetings, football practice, and the like. This is made for students to properly organize and stay committed to their agendas. 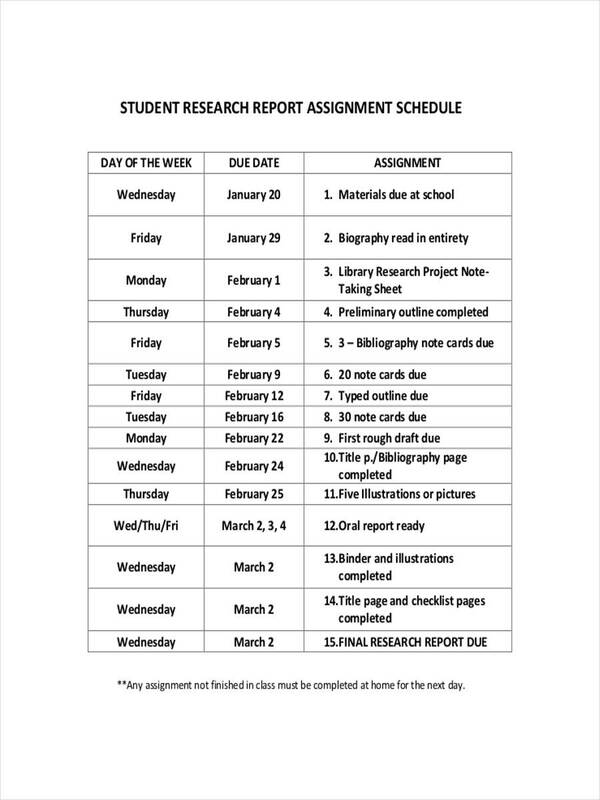 A student’s sample schedule is generally made up of the same daily schedule. 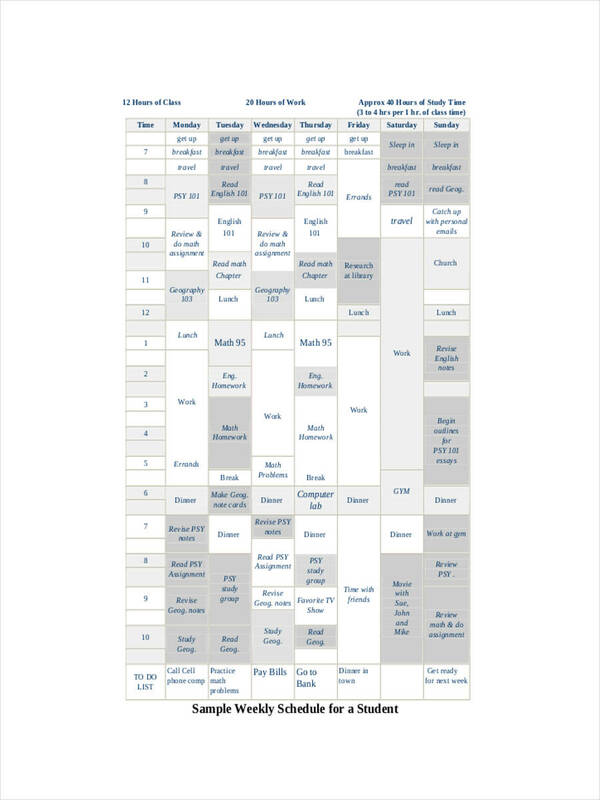 Classes that are to be taken daily or regularly are listed repeatedly in a table. A time of day is allocated for certain classes or activities. An easy way of indicating the same class periods for different days is by assigning a particular color or symbol for each. It’s best to provide a legend or to label each accordingly. 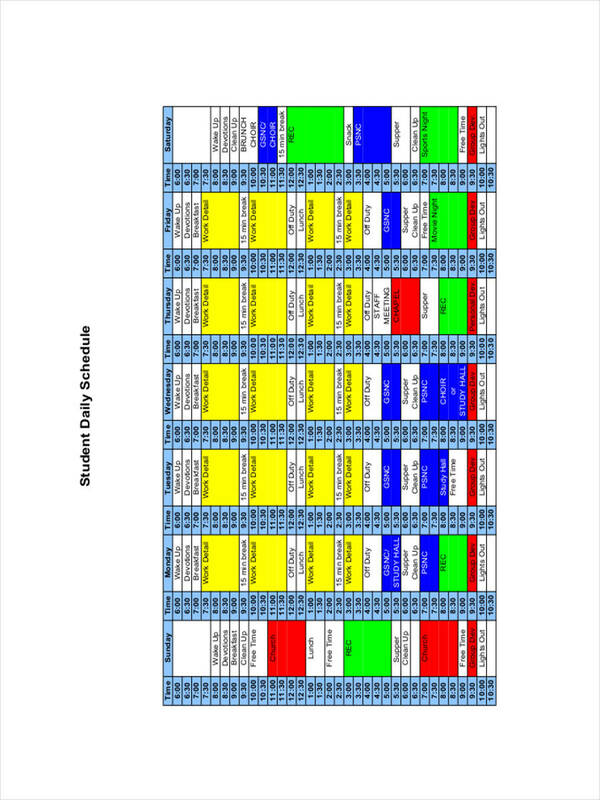 Finally, an interesting yet effective way of presenting a student schedule is to design it creatively yet clearly. 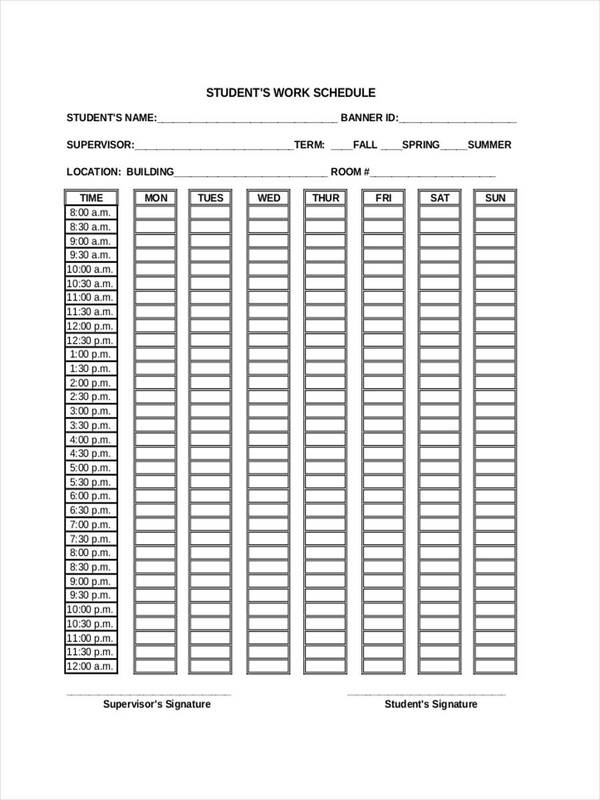 A customized schedule will help motivate a student to completing certain tasks. It doesn’t have to be too formal, it can be fun and creative as long as it could be understood. With everything going on in a student’s life, it’s easy to get sidetracked. 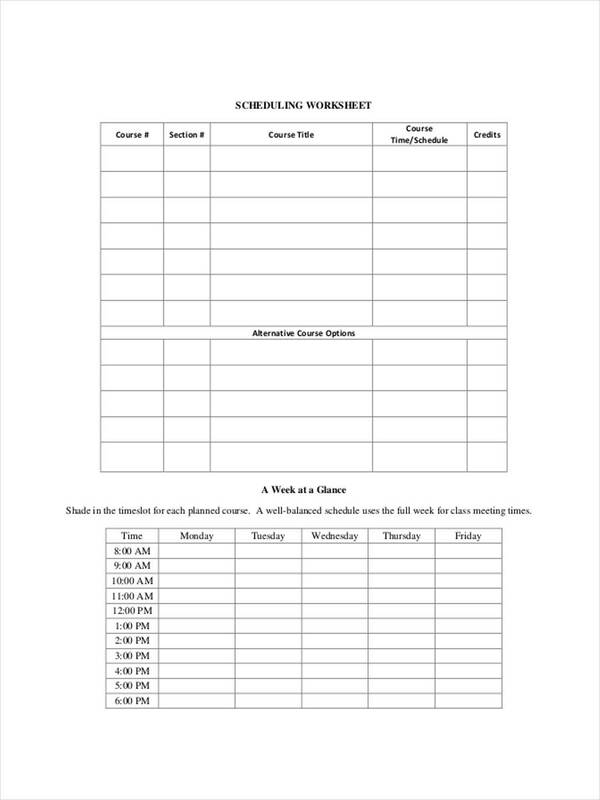 Having a student schedule will allow a student to take note of deadlines, meetings, chores, and other tasks. With this, early mornings wouldn’t consist of last-minute preparations and multitasking. The process of writing down a schedule will allow an individual to think ahead of time instead of just going with the flow. 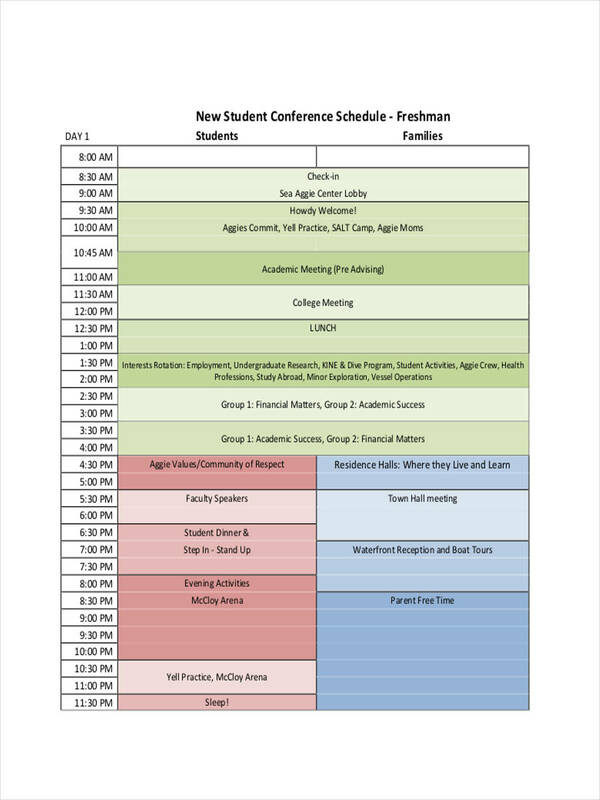 Furthermore, a student schedule can actually play a part in one’s personal development. The student may discipline oneself to accomplish tasks on time which will then be a trait that they could carry on in their careers. You might be wondering, why should I set a schedule when certain circumstances may greatly affect it? Well, it’s not about doing exactly what’s on the schedule but it’s about setting a smart goal for yourself. It’s about being flexible while still aiming to attain something. You’ll be able to manage your time effectively. It can record the things you need to do as well as the things you’ve done. 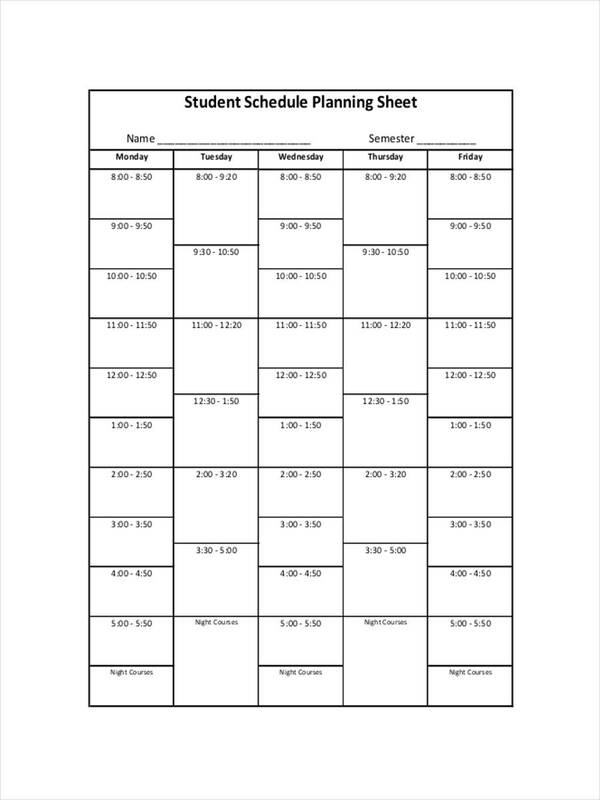 A student schedule can also go beyond academics, individuals can use the schedule to make social plans and family plans.